Figure 9.9: Normal ground truth overlays. The top row in each row pair is the left carotid artery overlayed with the ground truth tracing of the inner lumen wall, and the bottom row is the corresponding image of the right carotid artery. Some lumens have a circular shape, while others have an elliptical shape. example, when K = 3, zijj = [0,1, 0]T means we assign the pixel at (i, j) to class 2.
i,j (k,l)eNi,j is the energy function which decreased (causing p(z | ©) to increase) when neighboring pixels were classified into the same class (the set of the neighbors of (i, j) is denoted as Ni, j). Q($ | $(p)) = (log p(y | z, $) + log p(z | ©) | y, $(p)>. where k = 1, 2, ...,K, Zj is the kth component of zi, j ,and f (z^j) a "mean field" probability distribution (see Zhang ). and Geman and Geman ). Thus the technique was named expectation maximization-mean field (EM-MF) technique. 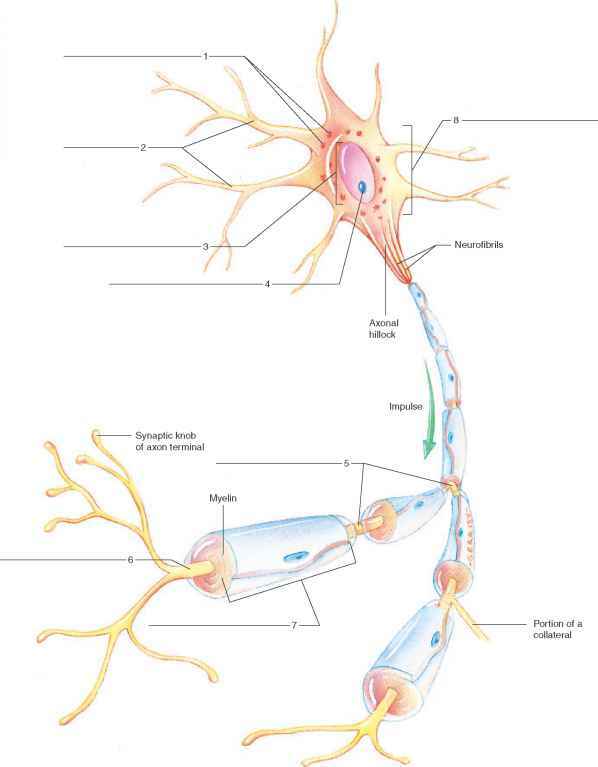 By Gibbs' modeling of the homogeneity of the tissue, resistance to thermal noise in the images was obtained. The image data and intensity correction were coupled by an external field to an Ising-like tissue model, and the MF equations were used to obtain posterior estimates of tissue probabilities. This method was more general to the EM-based method and is computationally simple and an inexpensive relaxation-like update. For other work in the area of MRF for brain segmentation see Held et al. .
equation: P(f) = Z exp(--T)E(f)), where Z = £f, exp(-ETf1)and P(f)isthe probability of the configuration f, T is the temperature of the system, k is the Boltzmann constant, and Z is the normalizing constant. The major disadvantages of MRF-based classification include the following: (1) The computation time would be large if the number of classes is large. In such cases, one needs to use the multiresolution techniques to speed up the computation. (2) The positions of the initial clusters are critical in solving the MRF model for the convergence. Here, the initial cluster was computed using K-means algorithm which was a good starting point. However, a more robust method is desirable. Figure 9.10: Markov random fields (MRF) classification process. Input is a gray scale perturbed image with left and right lumens. The number of classes, the initial mean, and the error threshold are inputs given to the system. 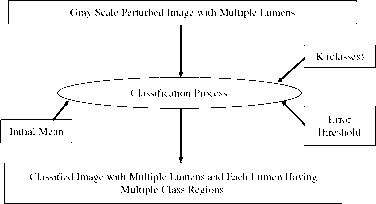 The result is a classified image with multiple class regions in it. Figure 9.11: The Markov random fields (MRF) segmentation system. Given the initial center, the number of classes K, the Markov parameters of mean, variance, and covariance, and the perturbed image, the current cluster center is calculated. Using the expectation-maximization (EM) algorithm, new parameters are solved and new cluster centers are computed. The error between the previous cluster center and the recently calculated cluster center are compared, and the process is repeated if the error is not less than the error threshold. After the iterative process is finished, the output is a segmented image. centers are computed. The error between the previous cluster center and the recently calculated cluster center are compared, and the process is repeated if the error is not less than the error threshold. After the iterative process is finished, the output is a segmented image.